At just the right size, carbon nanotubes can filter water with better efficiency than biological proteins, a new study reveals. The results could pave the way to new water filtration systems, at a time when demands for fresh water pose a global threat to sustainable development. A class of biological proteins, called aquaporins, is able to effectively filter water, yet scientists have not been able to manufacture scalable systems that mimic this ability. 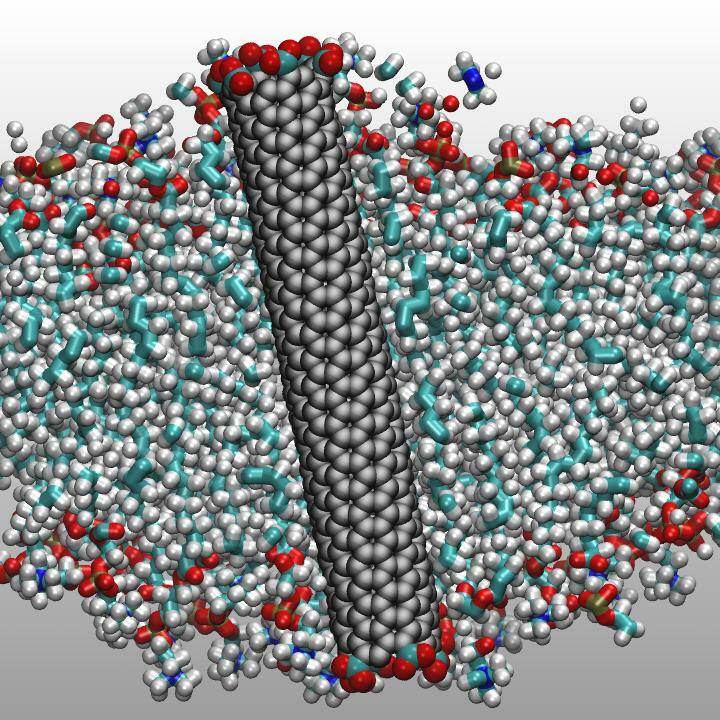 Aquaporins usually exhibit channels for filtering water molecules at a narrow width of 0.3 nanometers, which forces the water molecules into a single-file chain. Here, Ramya H. Tunuguntla and colleagues experimented with nanotubes of different widths to see which ones are best for filtering water. Intriguingly, they found that carbon nanotubes with a width of 0.8 nanometers outperformed aquaporins in filtering efficiency by a factor of six. These narrow carbon nanotube porins (nCNTPs) were still slim enough to force the water molecules into a single-file chain. The researchers attribute the differences between aquaporins and nCNTPS to differences in hydrogen bonding – whereas pore-lining residues in aquaporins can donate or accept H bonds to incoming water molecules, the walls of CNTPs cannot form H bonds, permitting unimpeded water flow. The nCNTPs in this study maintained permeability exceeding that of typical saltwater, only diminishing at very high salt concentrations. Lastly, the team found that by changing the charges at the mouth of the nanotube, they can alter the ion selectivity. This advancement is highlighted in a Perspective by Zuzanna Siwy and Francesco Fornasiero.